Developed by Michael Toennies for Windows and Linux. Daimonin is a graphical MMORPG. Its open source and free playable. It offers 2D isometric graphic, sound effects, background music and a complete editor for map making. Everyone can become a map wizards and create maps which can be uploaded to the game so other can play them. 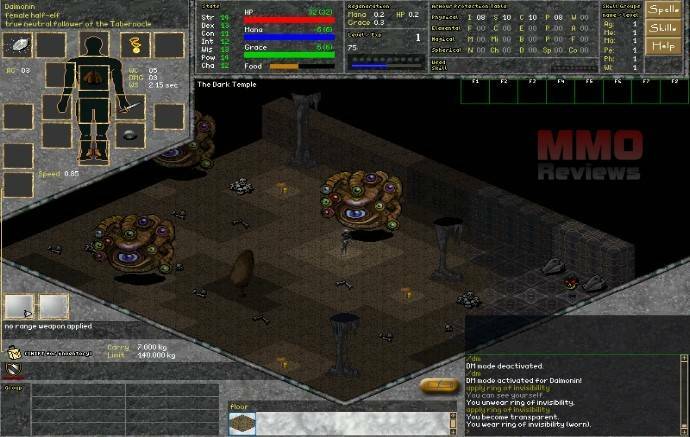 The engine offers nearly all concepts of modern online rpgs: server sided scripting plugin in LUA, modern and GUI handled quest system, instances, unique (permanent saved) maps, mob aggro ranges & LOS server sided, factions, item quality & conditions (repair/smithy), scriptable AI, server sided AE (area effect) spells group playing, etc. The gameplay allows great object interaction. You can open every chest or shelf you found somewhere in the game. Torches on the wall can be turned on or off. This games & entertainment program is freeware, so you can download and use it absolutely free. I love this game, have been playing it for over five years. Its also very community oriented, and you get to contribute ideas. Great game! Been playing it for a while – great community spirit. just tried game… confusing at first but gets fun when learnting basics.